I’m feeling pretty good today. I’m feeling good because I believe this is the first day in two weeks that someone in this house has NOT had some form of the stomach flu. This flu was especially nasty because a) it coincided with Thanksgiving traffic and we suffered through a five hour car trip, much of it spent while holding a bag of a child’s warm vomit and b) because when we returned home from said trip, we found a puddle of sewage bubbling up in the basement. Every time somebody flushed a toilet (which happens quite often when the stomach flu pays a visit), the pipe in the basement would spew sewage. I immediately got on the phone and called plumbers. Plumbers can be so very dramatic that I half expect them to burst into iambic pentameter. I have a particularly bad memory of a plumber visiting our very first house in LA and taking a video of the scope he did of the plumbing underneath our backyard. The video was dark, creepy, and emotionally narrated. It soon became known as the “Blair Witch Plumbing Project.” It was LA, so perhaps an out of work actor was doing our plumbing and filmed the video, but I soon learned that all plumbers have a flair for the dramatic. The problem sounded enormous. Plumbers gasped and sighed at my descriptions. Nobody was interested in coming to help. I was quite sure that whoever did come to help would leave our house with all of our money in hand. I was all but ready to tell the kids that they were getting plumbing for Channukah. The plumber who finally agreed to come (and who frankly sounded excited by the challenge) arrived first thing Monday morning. I think plumbing is a great job — not just because of the bucks involved, but because people are REALLY happy to see you. 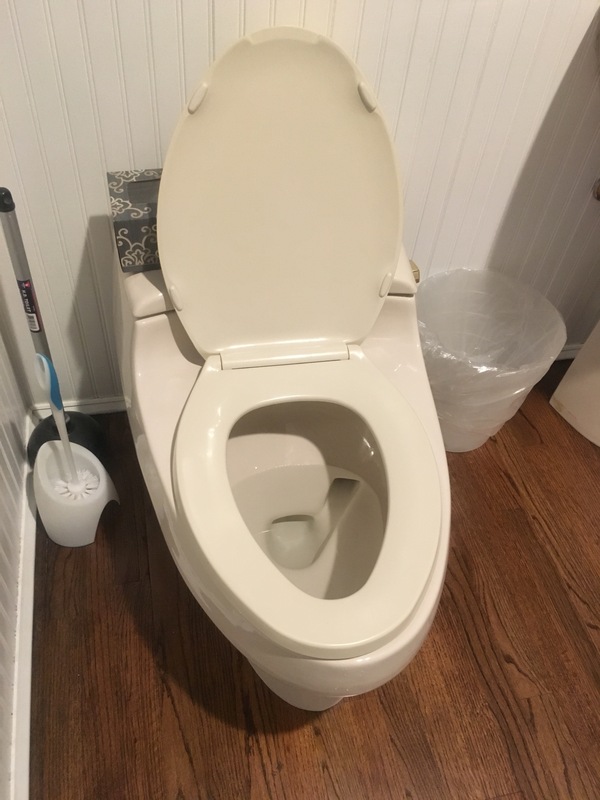 After twelve hours of no plumbing and with several family members on the tail end of the tummy bug, our house was beginning to resemble a large, furnished port-o-potty. I almost leapt into the arms of the unsuspecting plumber at our front door. I think I may have scared him a bit with my exuberance. He beat a hasty retreat to the basement to fix the problem. A couple of hours later, he emerged victorious. Crisis averted. The problem was not a bad as it sounded. At least for now. We live in an old house. Even with updated plumbing, problems arise. Here is a picture of the bag-o-vomit. And here is a picture of a toilet in our house. I could have taken pictures of the basement spewage, but even I have my limits. We are cycling through the stomach flu at the moment. Some of us are on round two less than a week after recovering from round one. Why so much flu? What are we doing wrong? 1. 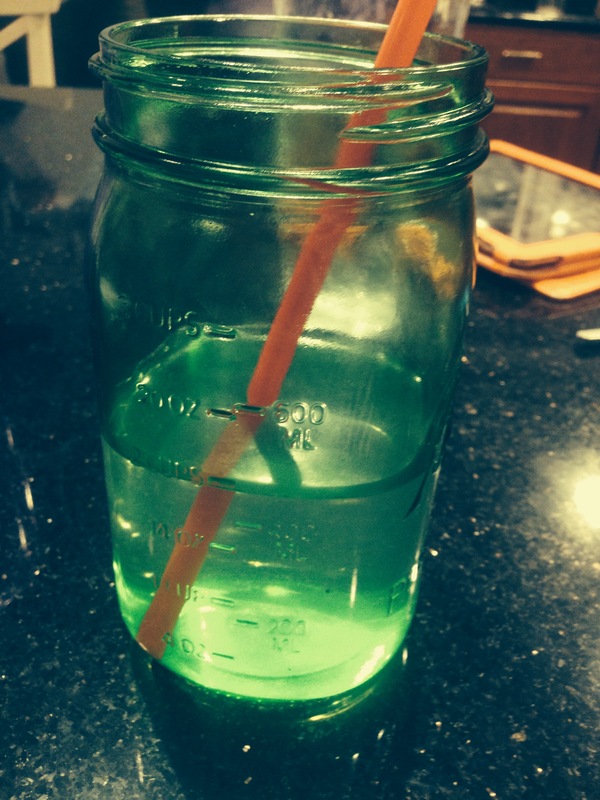 I may not have the right remedy as I am convinced that truly anything can be cured by drinking ice cold lemon water out of a jar. 3. Something bigger: God thinks I’ve had enough sleep for one lifetime and from here on out, it’s probably best that I spend half of each night awake. It’s humbling. We are all equal in the eye of the toilet bowl. Big props to the offspring for looking after things while I was bedridden. There were mysterious deliveries of food, paid for with wads of cash of unknown provenance. But the ship sailed on… Somehow they all ended up in bed, and they kept me well stocked with all sorts of liquids and antacids. Holy life cycles Batman. How did that happen? I haven’t been flu ridden all year – how did I miss this? In bed with the flu, a moron, and a bunch of pedophiles. This was supposed to be the week I got a flu shot. Instead, this is the week I got the stomach flu. Yesterday, while delirious and bed-ridden, I got to watch some daytime TV. Wow. Who let Jenny McCarthy on the View? The woman is a complete moron. Even if I didn’t know about her toxic views on vaccination, I’d still have been shocked by her ignorance. Watching her was almost more unpleasant than the stomach flu. I suspect she wears glasses to seem less unintelligent, but if that’s her goal, she could consider taping up her mouth. Shame on you, Barbara Walters. 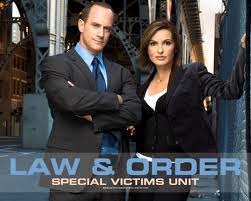 I also discovered that somewhere in TV-land there is Law and Order SVU playing at ALL TIMES. I could not watch much of the daytime drivel (Rachel Ray gives me indigestion, looking at Kelly Ripa makes me want to slather on some sunscreen and then eat a big meal, which doesn’t go over well with the stomach flu), so I watched Law and Order for about 13 hours in a row. By the end of my marathon, I wanted to install extra locks on all the doors and hire a security guard full time to keep out the pedophiles. This morning I woke up able to get out of bed. 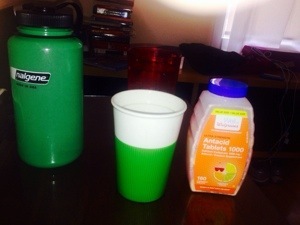 M, who had been playing sick nurse, looked green. He made several proclamations, most of them to the effect of: “I’m not feeling well, but I won’t be getting this as badly as you did” and “this is nothing I can’t work though.” He kept saying this as he doubled over and fell into bed, even as he broke out into shivers. He kept on saying it as he tried to take work calls horizontally, wearing his Judy-from-Time-Life headset. I have stopped correcting him. I’m going to let him have his moment in the macho-sun. Apparently, Francie came into my room in the middle of the night and told me that she threw up. It seems I told her to have a glass of water and go back to bed. I’m trying not to feel badly about it. In case she thought I didn’t believe her, she came into my room this morning and threw up all over the place. Point taken. Luckily, this was only the week I was supposed to get a flu shot, and not the week I was supposed to change the world. There a few things I know for certain. One of them is that whenever M travels, one of the kids will bring home the stomach flu. There are many snippets of these years that I know I’ll forget one day, but among them is NOT the time that Efram threw up directly into my mouth. I know I tend to exaggerate, but this actually did happen, and not just in my imagination (as Fiona would say, “Is this for real life?”). M was away on some trip or other. Efram was not yet two. He cried. I picked him up. He pointed to his mouth, so I put my face right near it to have a look inside and bada-bing, he projectiled right into mine. He’s nine now, but I’ve never been able to look at him the same way since. She yacked into the container and shoved it at me. 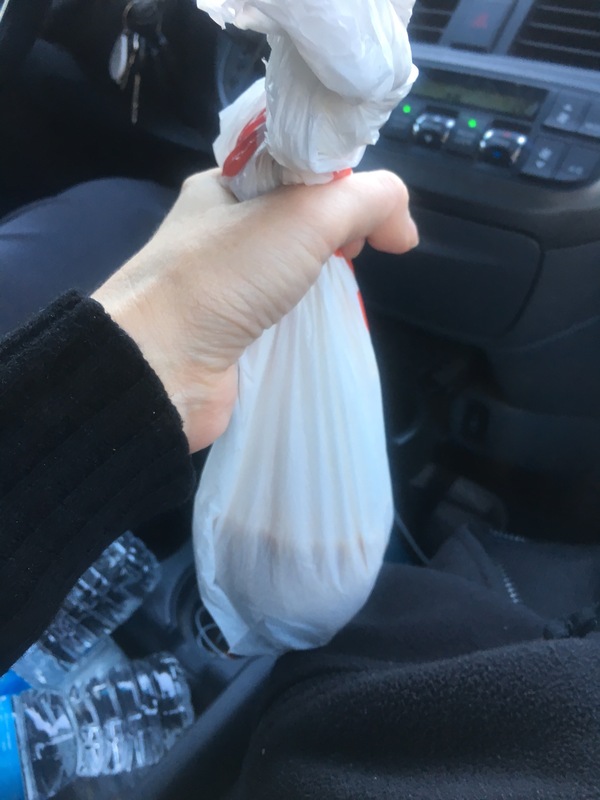 So there I was, driving around the Bronx carrying a open container of brown, lumpy vomit. Needless to say, although I had planned on it, I did not make lentil soup for dinner. Fortunately for me, one does not need to see the doctor for stomach flu. I say this because we haven’t yet been accepted by the pediatrician. Sadly, unlike New Yorkers, Seattleites do not respond well to threats. The files are trickling in. I think three of the kids have been accepted. I do not know if Sidney is among them. I’m considering getting some letters of recommendation, maybe even writing a personal statement. Perhaps I’ll even bake a cake for the admissions officer. Now I’m really getting carried away.